This Fall, the Mattress Factory is offering ARTLab programs with each of the artists exhibiting in the museum's Artists in Residence exhibition. ARTLabs are programs for all ages + FREE with museum admission. Read on to learn more about the first ARTLab in the series, and what to expect from the next. 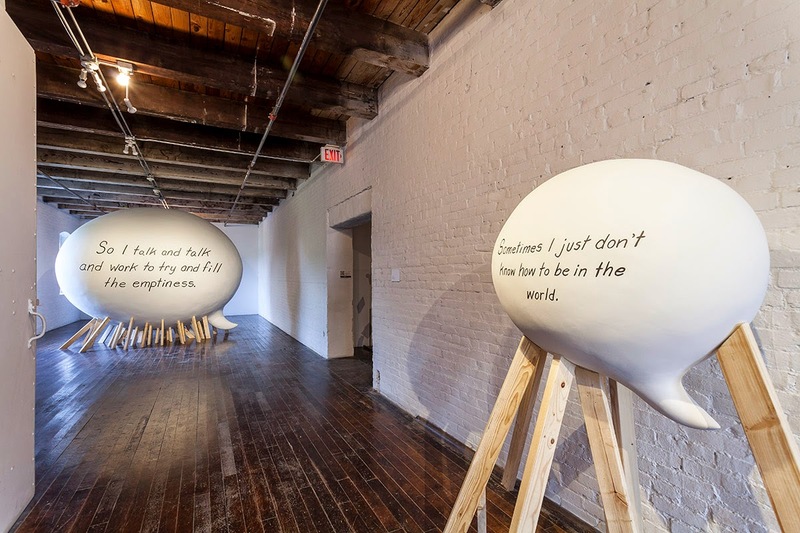 John Peña’s Word Balloons is a striking new piece at the Mattress Factory. It is a physical manifestation of the artist’s vulnerability during his creative process. This physical translation of emotions in the form of cartoon word bubbles confronts the viewer in enormity of size and simplistic design. The piece consists of two “balloons” crafted from extruded foam, plaster, wood, and screws, each with a statement painted on the surface. The first confronts the viewer as he/she exits the elevator. At three feet, it the original prototype for the 12 by 6 by 9 foot balloon that fills the adjacent gallery. The balloons are supported by wood beams, highlighting the weight of the words. Peña is expressing his emotional challenges while working as an artist and also stressing the impact of the words we all speak and their effect on the world. Visitors participating in ARTLab were given two-dimensional paper word balloons to write on and post throughout the galleries. This externalization of a visitor’s internal experience of viewing art emulates Peña’s Word Balloons, temporarily leaving a physical trace of personal reflection on the museum. Karen Forney, Mattress Factory museum educator and local comedic improviser, will demonstrate how to use an overhead projector, cut paper, transparencies, sharpies, and found objects to create low-tech animations and shadow puppetry. You'll also get a chance to improvise a crazy story right on the spot with your creations, with some enthusiastic coaching from Karen! Bring your devices and film your creations and in no time you'll be an instant animator and storyteller. Tweet or Facebook your creations so the Mattress Factory and the world can laugh along with you at your spontaneous art!